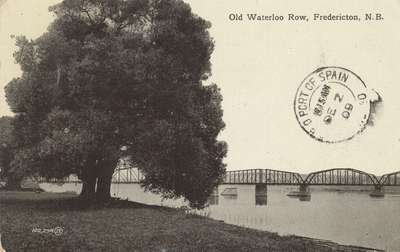 Old Waterloo Row, Fredericton, N.B. A postcard sent to Rev. R.B. Layton in San Fernando, Trinidad, B.W.I. mailed from Fredericton, New Brunswick. Your paper for the Band and letter have both reached F'ton. O.K. It is a splendid paper and very interesting. We shall have it at Band next Tuesday evening. It puts me very much in mind of your talk on Labrador this evening, and you know how much the children enjoyed that (and older ones too) so this will speak for itself. Many thanks Mr. Layton.